Florida School Shooting Suspect Was Troubled, Expelled from School - Integration Through Media ....! (VOA): Nikolas Cruz, the suspect in the third most deadly school shooting in American history, is being described as a troubled young man who was expelled from school for disciplinary reasons. Broward County Sheriff Scott Israel acknowledged the 19-year-old had been expelled from Marjory Stoneman Douglas High School in Parkland, Florida, but said "I don't know the specifics." Victoria Olvera, a junior at the school, said Cruz was dismissed last year after a fight with his former girlfriend's new boyfriend. Former classmate Joshua Charo said Cruz had been expelled for fighting and for having bullets in his backpack. Broward County School District Superintendent Robert Runcie said he was not aware of any threats post by Cruz at the school, but math teacher Jim Gard told the Miami Herald he recalled the school administration distributed an email warning teachers about Cruz. "We were told last year that he wasn't allowed on campus with a backpack on him," Gard said. "There were problems with him last year threatening students, and I guess he was asked to leave campus." 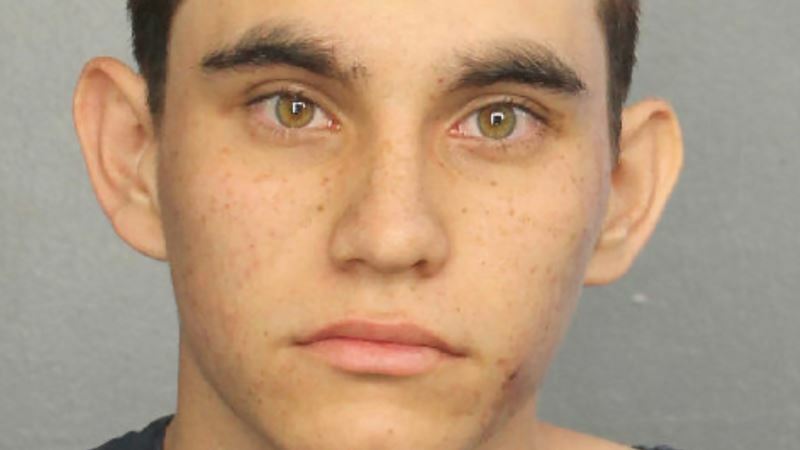 Cruz, a member of the Junior Reserve Officers' Training Corps as a freshman at the school, enrolled in another Broward County school after his expulsion, school officials said. The suspect had no previous arrests but had long displayed troubling behavior. Dakota Mutchler, who used to be close friends with Cruz, saw Cruz only infrequently after his expulsion more than a year ago. "He started getting progressively getting a little more weird," Mutchler said. Sheriff Israel told reporters investigators have searched Cruz's presence on social media and said, "Some of the things that come to mind are very, very disturbing." On an Instagram page identified by friends as Cruz's and which has since been taken down, his love of weapons was obvious. One post shows him wielding knives between his fingers. Another shows him holding a black handgun as he wrote "Pistol fun a– f–k." Another of his posts displayed the definition of "Allahu Akbar," an Arabic term that means "God is [the] greatest." Federal authorities said Wednesday they did not believe the shooting related to terrorism. Cruz, who police said was armed with an AR-15 semi-automatic assault rifle, was adopted when he was younger. He and his biological brother were adopted by Lynda and Roger Cruz of Long Island, New York. The family then moved to Broward County. Cruz's mother died of pneumonia on November 1, friends and family members said, and the father died of a heart attack several years ago. A relative who lives in Long Island, Barbara Kumbatovich, said the boys were left in the care of a family friend after the death of their mother. Cruz said he was unhappy there and was given permission to live with a friend's family in northwest Broward County in late November. The family's lawyer, Jim Lewis, did not identify the family with whom Cruz most recently lived, but Lewis said the family was aware Cruz owned an AR-15. They made Cruz keep the weapon locked in a cabinet, although he maintained possession of the key. In Pictures: Florida School Shooting Another relative who requested anonymity said Cruz had been diagnosed with autism. Notably, the shootings occurred on Ash Wednesday, a Christian day of peace, and on Valentines Day, a day of love and affection.